Light and comfortable sweater for outdoor life and travelling in warm climates. Made from a merino wool/polyester blend that wicks away moisture. Merino wool resists bad odours and is soft and comfortable against the skin. 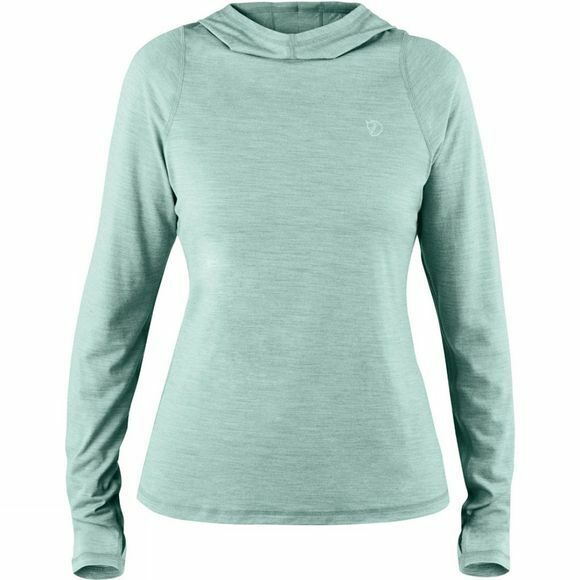 Perfect as a functional base layer but the sweater also works as a light mid layer over a t-shirt or tank top. The cut is fitting and feminine with gussets under the arms for extra freedom of movement. Long sleeves and a hood offer light protection from the sun, and thumbholes stop the sleeves from riding up.